Their 'So Nice' tour came to Chicago on July 21 as part of Bossa Nova’s 60th birthday celebration. Here’s the finale that brought fans to their feet! Scroll down for the story and the photo that says it all! 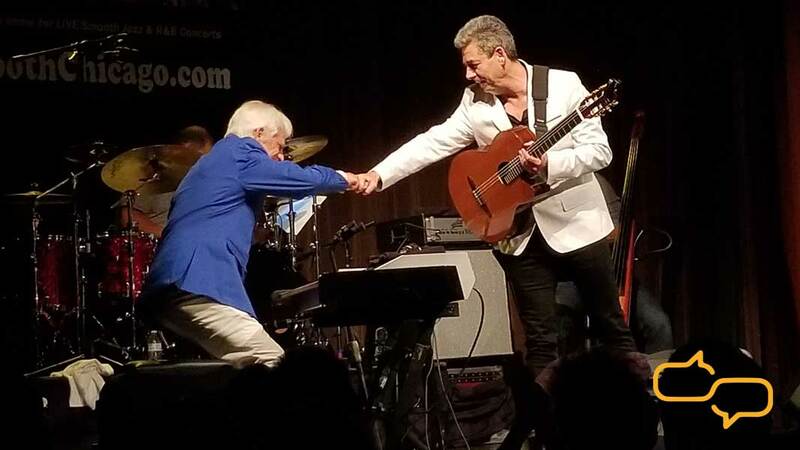 Longtime musical friends David Benoit and Marc Antoine released their Bossa-themed album So Nice in 2017 to rave reviews. But July 2018 brought them to Chicago to celebrate Bossa Nova’s 60th birthday with a sold-out crowd at the music room in Lowes Rosemont. Click the video above for ‘live’ action. The album’s ten songs include Bossa Nova originals from both, with ‘Caminando’ topping the charts at #1 for six consecutive weeks. The title track is one of two Bossa Nova classics included, with the other being Antonio Carlos Jobim’s ‘Só Danço Samba’. Surprisingly, both songs have more than one alias. ‘So Nice’ is also known as ‘Summer Samba’ and by its Portuguese title, ‘Samba de Verão’. The song was written by Marcos Valle and his brother Paulo Sergio Valle. ‘Só Danço Samba’ is a Antonio Carlos Jobim original also called ‘Jazz Samba’ and ‘I Only Dance Samba’; the English translation of it’s Portuguese title. You can read the 5-star reviews and purchase the album with the link below, and you’ll be supporting Connectbrazil when you do. Thank you! Bossa Nova celebrates it’s 60th birthday this summer.